KERISE Delcoure’s first foray into public art was a labour of love and a learning curve, with 12-hour days spent working on her new mural at Carine Open Space. 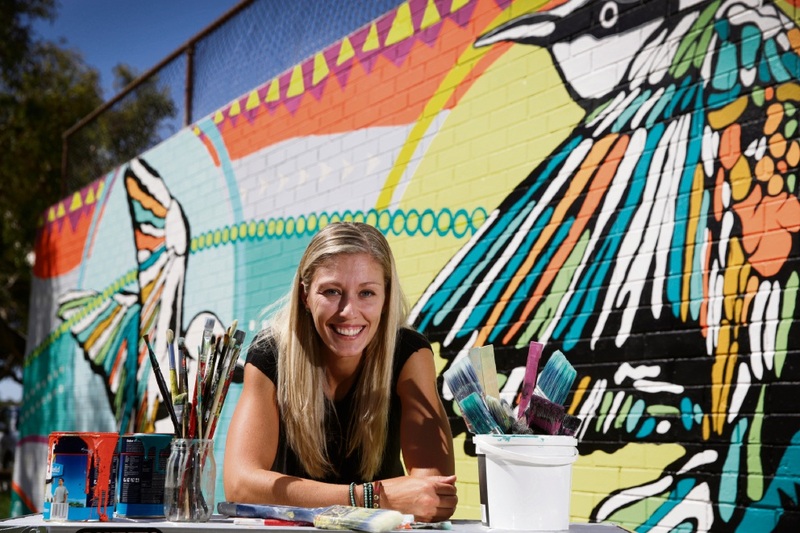 “I was working on the mural when the cyclone hit up north and we had those incredibly humid hot days; a couple of times I would have to crawl under my ladder, put a towel over the top and paint from under it,” she said. “I have been an art teacher for 11 years and I’ve taken the big plunge to jump out on my own as an artist so this is my first mural project. Ms Delcoure said she chose the rainbow bee-eater bird as the subject because they migrate to the parklands. “These birds migrate annually to the area, it is such a gorgeous community space; all the sporting groups and local community share it with the wildlife,” she said. Ms Delcoure said the wall was often targeted for graffiti but public art was a way to prevent tagging and vandalism. “This wall has been targeted for graffiti a lot especially because it faces the road and putting a commissioned piece of artwork is a great strategy to prevent tagging,” she said. The mural was commissioned by the City of Stirling as part of the Public Art Policy, which aims to brighten up local areas. City of Stirling acting customer, communications and activation manager Simone Holmes-Cavanagh said the City had commissioned a number of works. “Kerise Delcoure’s mural was selected because it best reflected the wildlife and wetland significance of Carine Regional Open Space,” she said.